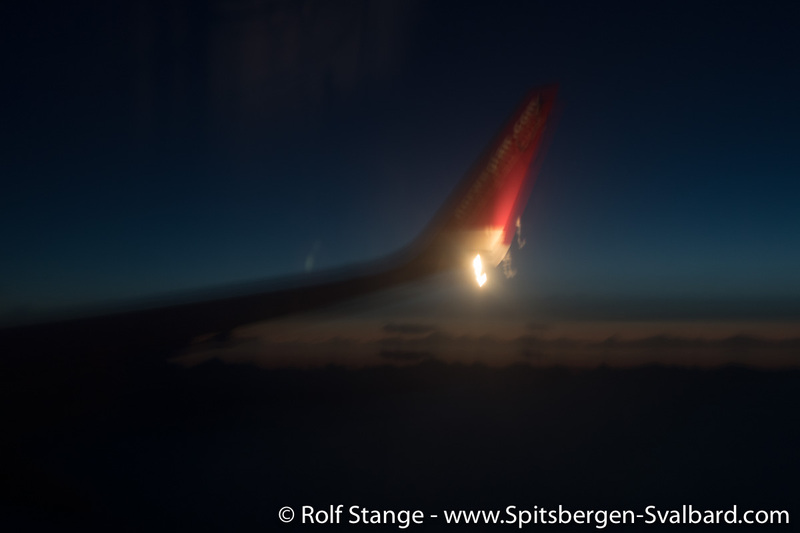 Home → * Triplogs with photo galleries → Arctic blog: Jan Mayen, Spitsbergen → The arctic blog continued: back to Longyearbyen! 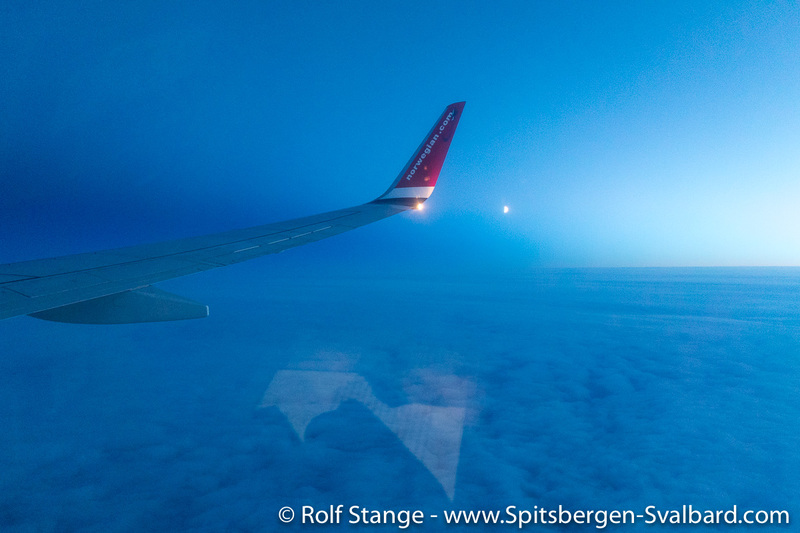 The arctic blog continued: back to Longyearbyen! After a winter- and christmas period in our southern home, we return to our northern home: back to Longyearbyen! We spend a few days in Norway on the way up, visiting good friends, before we board the plane in Oslo. 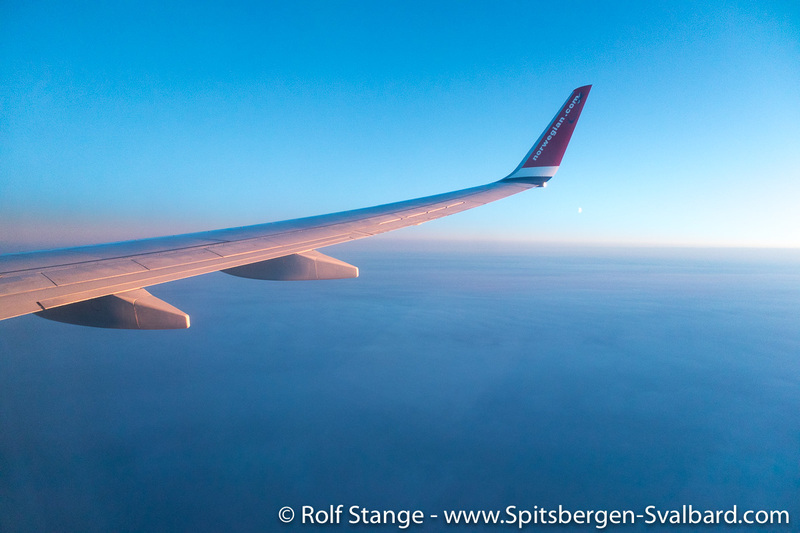 The flight leaves from Oslo Gardermoen in the morning and arrives in Longyearbyen mid-day. We fly away from the sunlight and into the darkness. While climbing up the ladder to the plane, we enjoy a few last moments of sunlight. They will be the last ones for several week. The magic of the polar night is waiting for us! The moon is waxing – that is not a secret, that is the same everywhere on Earth at the same time. But here, it is more important than elsewhere. Not only because far above the polar circle the moon is hardly seen during the summer, because then it remains largely below the horizon unless it is new moon, when you don’t see it anyway. But now, in winter, the moon is stunning. And it is a very important light source, much more than in latitudes where the sun is more reliable in wintertime. 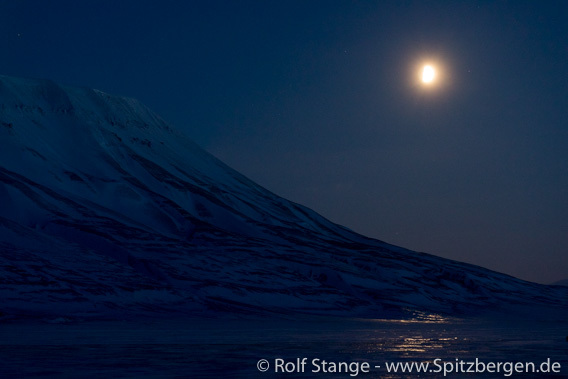 Adventdalen in the polar night (I): the moon is shining over Operafjellet. The appearance of the country is magical. 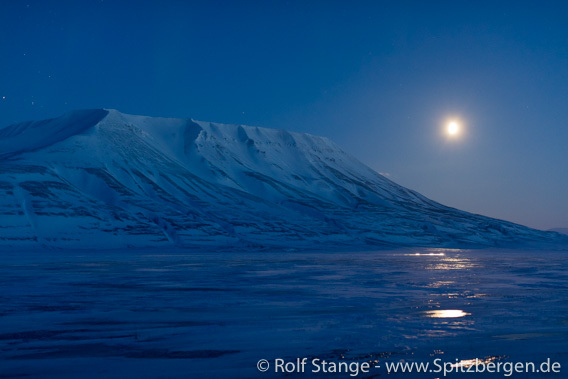 The moon is casting silver-blue light over the landscape which is covered with a thin layer of snow and ice. On photos, the moon appears very bright so you might even think it is the sun. Photographing this kind of beauty is a challenge. Most photographs are are far too bright. Of course you can expose your photo until they look as if taken on a sunny day. The results will be beautiful but they don’t have much to do with reality. Reality IS hauntingly beautiful, and it is, well … reality! It doesn’t get much better than that, but it is hard to capture in an image. The beauty that the eye which is accustomed to darkness perceives may just appear as darkness on a reasonably realistic image. And that can also be realistic, but maybe not quite the reality, if that makes sense. (? depending on how well your eyes are accustomed to darkness when you are out in the field). I am trying to find a compromise which is close to reality and delivers the real beauty of the polar night at the same time. 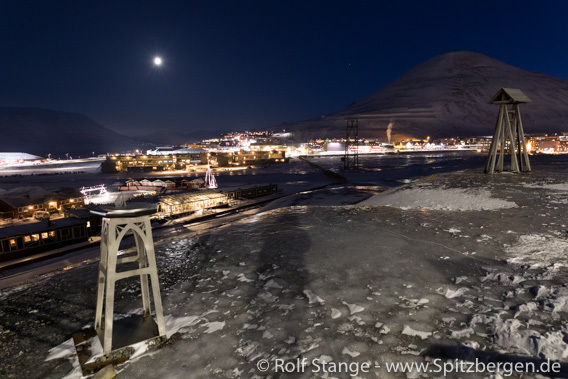 Last but not least for this first entry of my arctic blog 2019 an impression from Longyearbyen in the polar night. A perspective that, I am sure, many of you will know, but possibly in very different light conditions. 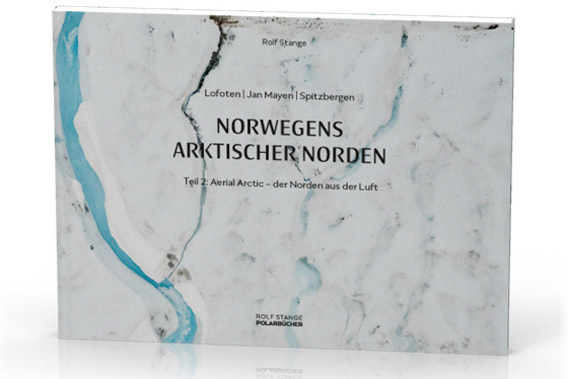 Finally, let me mention that I have made a new photo book, focussing on aerial photography and thus showing the Arctic from a very unsual perspective. In theory, the book is in German, but in practice, it does hardly have text. 134 out of 137 pages do just have stunning photos, placenames and a little map. Norwegens arktischer Norden (2) – Aerial Arctic shows Jan Mayen and Svalbard from the air.